Throwback to December 2017. I only had a few days left until I was driving home for Christmas, so I started looking for places where it was warm and where I could get a cheap flight to from Germany. 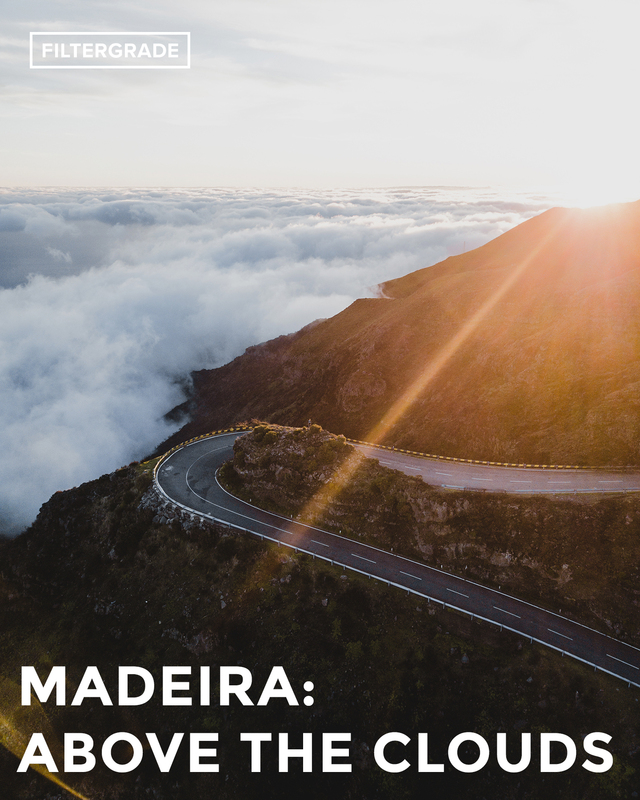 I always dreamed of traveling to Madeira, a remote Island in the middle of the ocean in front of the Portuguese coast. I looked up flights and found 150$ return tickets; from this point it was a sure thing for me. Step 2: Find someone to come with me. The first person I called was my good friend Pelle. It took him a few minutes, but after some persuasion he finally gave in and said yes to my plan. So there we are, 5 days later at the “Cristiano Ronaldo International Airport” in Madeira, Portugal. 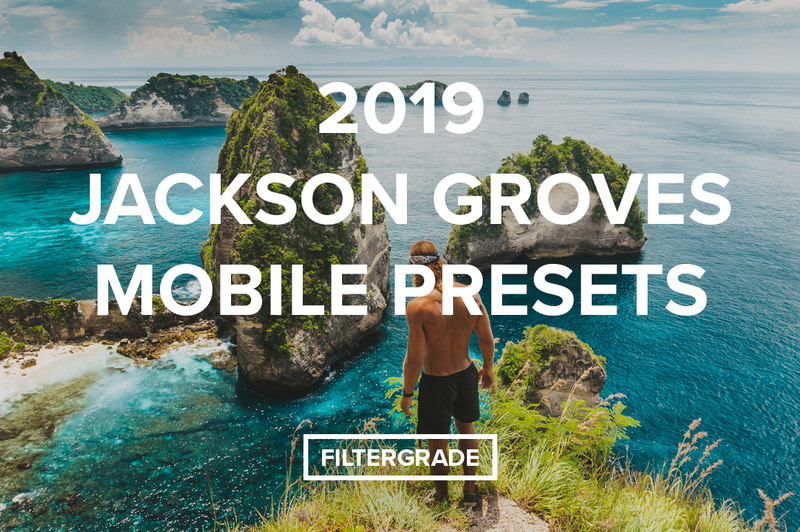 After getting our 50hp Fiat Punto rental car we headed straight to our AirBnB where we got a few hours of sleep before we started our first sunrise mission. 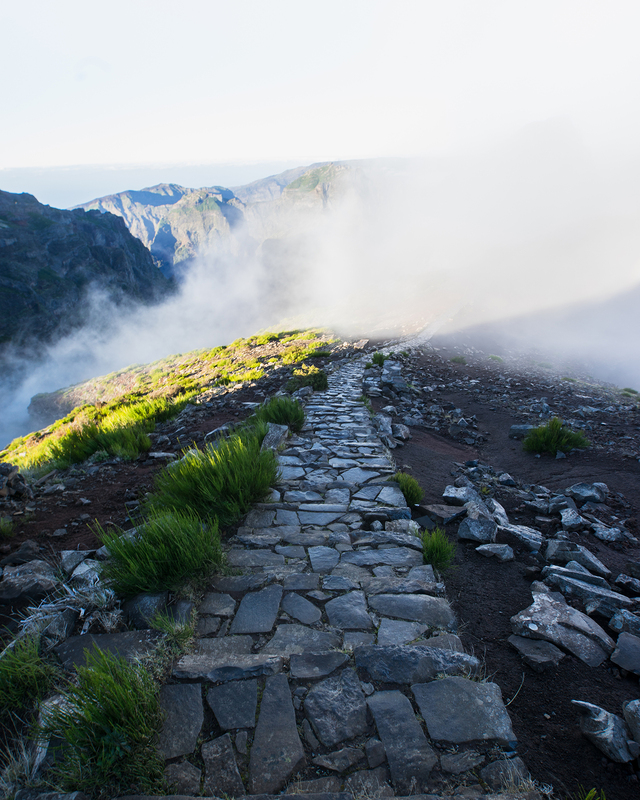 We got in our car at 6am and started driving towards the peak of Madeira’s 3rd highest mountain: Pico de Arieiro. After driving up the mountains and passing more than a few little, authentic villages for half an hour it got very foggy. Exactly what we wanted because fog meant there was going to be a sea of clouds at the peak of the mountain. After barely making it up the mountain with our Fiat Punto and having trucks overtake us, we finally reached the car park. Ready for the long hike ahead, we started walking. Little did we know, it was only an easy 15min walk to the balcony that we planned on shooting that day for sunrise. 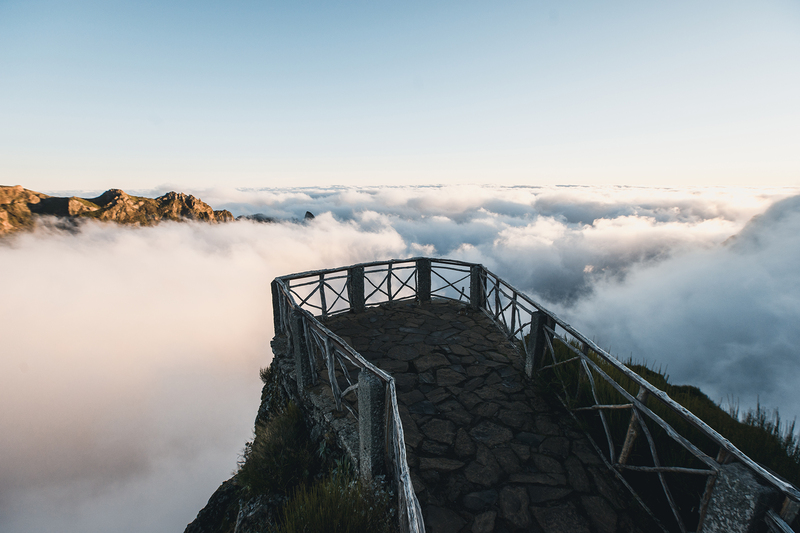 We arrived in complete darkness and had to wait for around 30 minutes for the sun to show up, but we already knew that we were just above the clouds so we were pretty excited for sunrise. Right when the sun began to rise I knew that it was for sure a moment I will never forget. Just as the sun started peeking over the horizon the only thing that was revealed by the clouds was the balcony we were standing on. 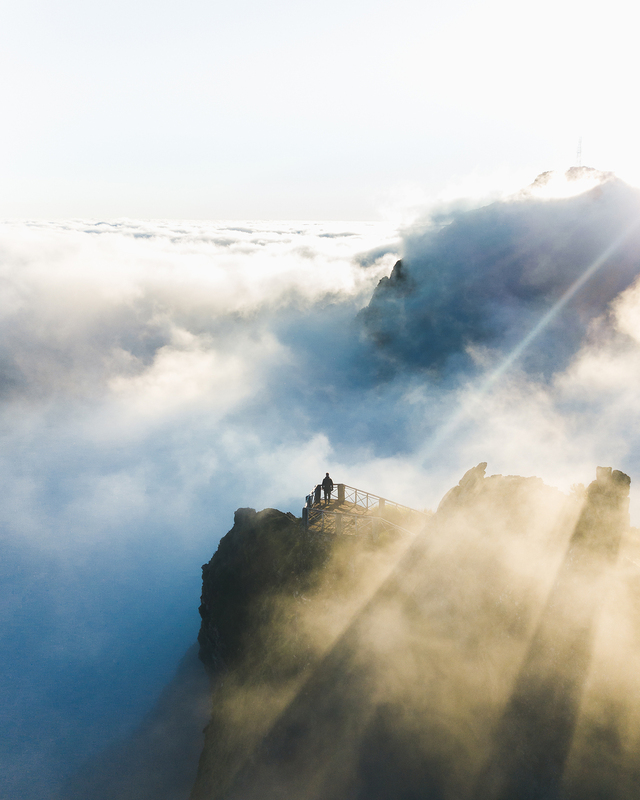 I started up my drone and lost it in the fog a couple of times, but once it cleared up a little I took the exact shot that I had in my mind for a very long time. Standing there in pure excitement and fear I would lose my drone in the strong wind it was not easy for me to push the shutter in the right moment, especially because I was my own model. It was basically a selfie. After exploring a bit around the mountain peak we headed back to the car park to drive back to our AirBnB to have some proper breakfast. 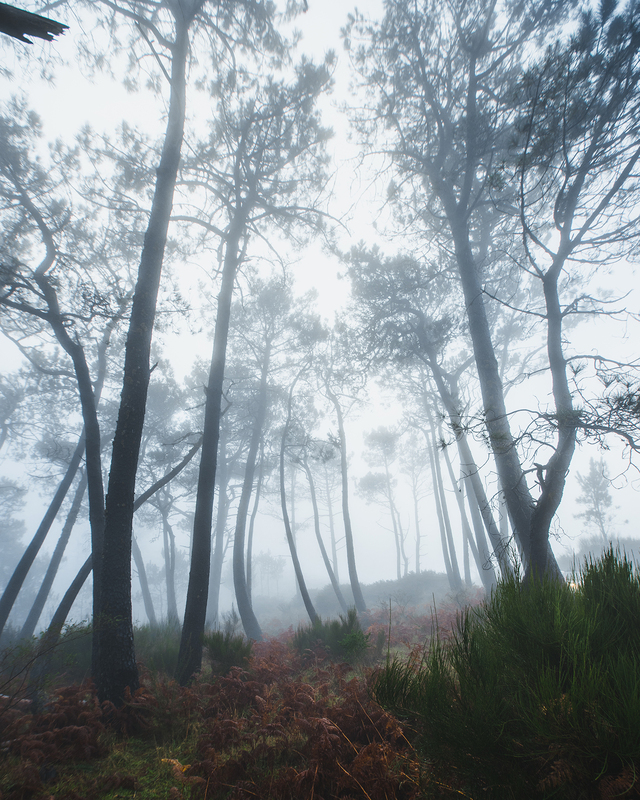 Despite the hunger – it was 10am by now – we had to stop after just five minutes of driving as we re-entered the fog and came across mystic forests and moody roads. Everything was covered in fern and we really felt like we were in the middle of Jurassic Park. 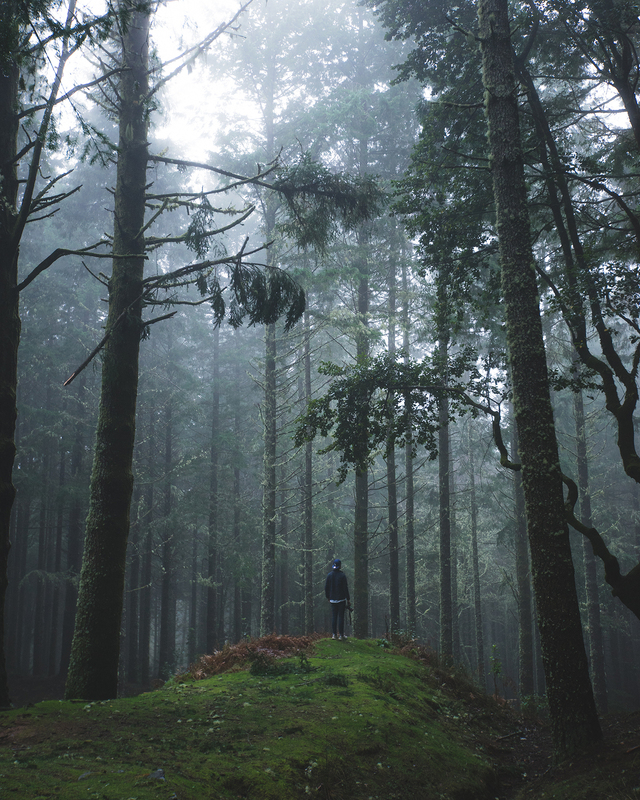 We left our car at the side of the road and turned on the hazard lights to go and shoot some pictures in the forest. 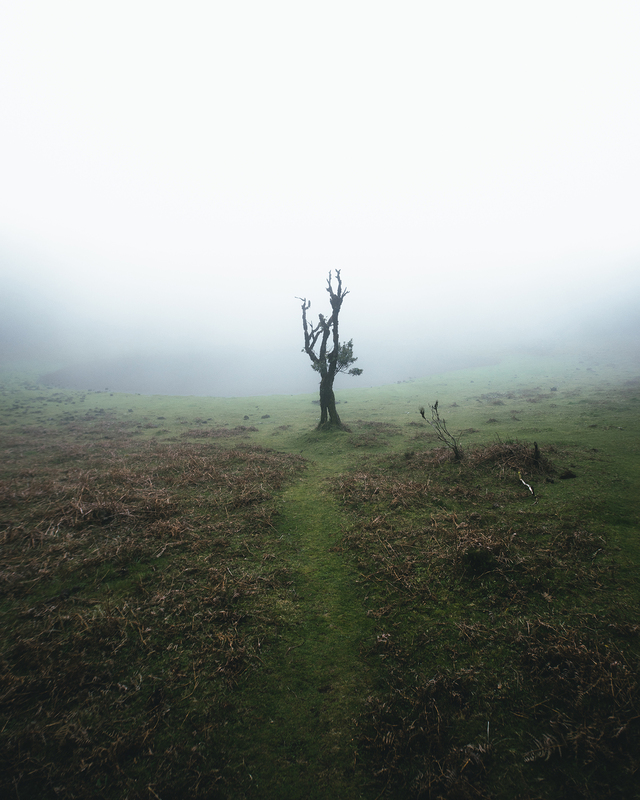 After walking through the bare, bleak trees for a while we came across a single tree standing there all alone in the fog. It was truly a mystical scene. When we got back to our car at 11am we realized we were starving at it really was time for breakfast. After we had an amazing breakfast (it was probably only that good because we hadn’t eaten in so long) we had a brief look at the pictures we shot so far. We were more than happy with the results and the overall impressions of this morning. 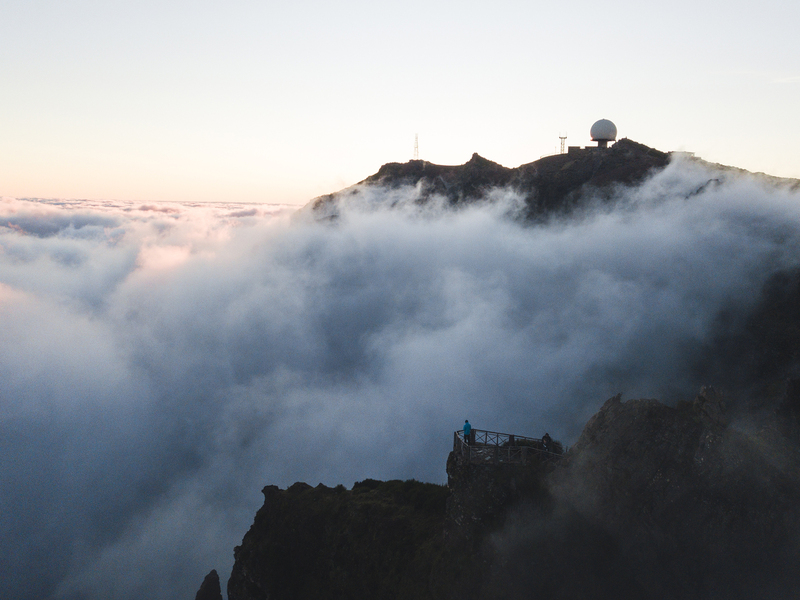 We had high expectations of Madeira, and they were already exceeded after the first sunrise. At that time, we were both tired from waking up so early to catch the sunrise so we decided to take a nap for a few hours until we decided to head out again- this time for sunset. 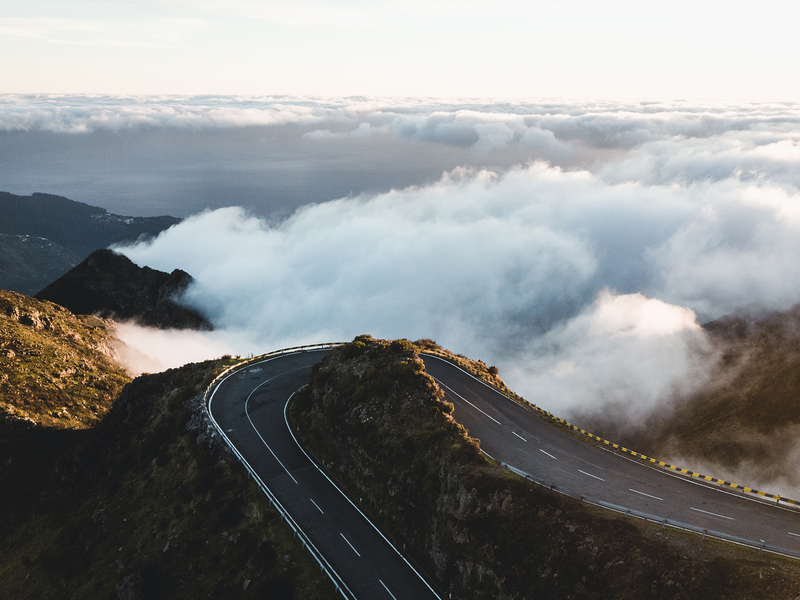 We tried getting to a spot that I found on Google maps where there was a road in the inner part of the island that was winding its way along the steep slope of the mountains and I imagined it to look super cool when there was a sea of clouds. We already saw the clouds when we left our AirBnB, so we were hyped the whole drive up to the spot. 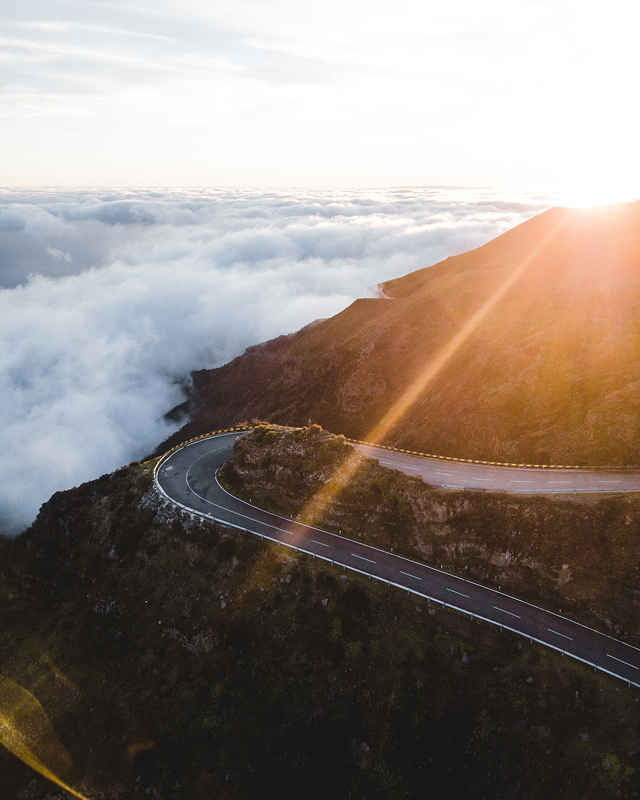 We got a little scared when we came across signs that said the road was in a bad condition because it’s probably not safe when there’s a 300 meter drop next to the road. Regardless, it was a fairly scenic drive with views of the valleys and the low clouds until we drove past big boulders that were on the road and that left huge cracks in the concrete. When we heard a loud bang in the distance we decided it was time to park the car and drive no further. Luckily we just arrived at the spot and I started my drone before the sun went down completely. Once again our minds were blown! How can this island be so unknown, yet so insanely beautiful at the same time?! We got some nice shots and left a little bit later when it got dark. After 2 hours of driving we were exhausted and decided to stop for some pizza and fell into our beds afterwards. What a day! 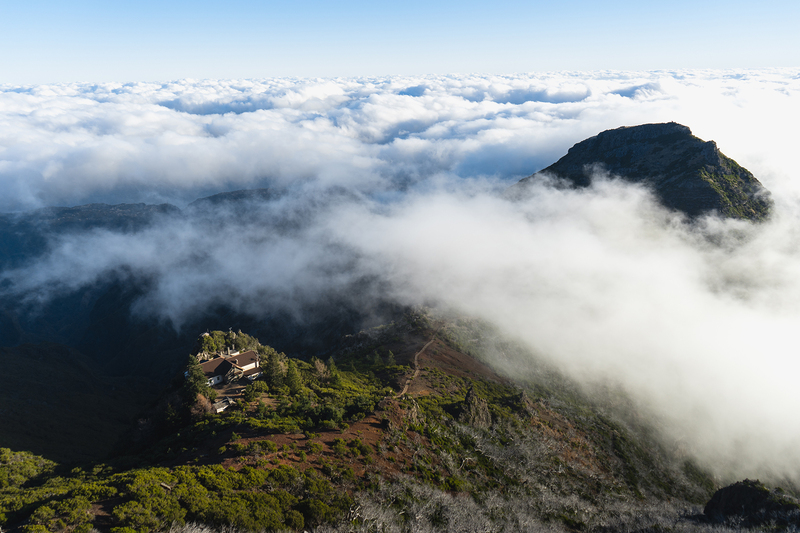 Enjoy some more shots of this day and maybe check the airfares for flights to Madeira, it’s definitely worth it! Hopefully this travel tale will teach you to be adventurous and to always take a leap of faith when you may be nervous to do something!